Early Morning reach Manali check in hotel after some rest, visit 450 years old Hadimba Mata temple situated in dense forest, Van Vihar, Mall Road, Tibetan monastery and handicraft centre etc. The rest of the day at leisure OR walk to the nearby picturesque village of Vashisht known for its hot sulphur springs etc. evening at leisure, overnight and dinner at Manali hotel. After breakfast you will visit snow point i.e. Solang Valley Famous for Skiing in winter, Enjoy rope way hill of Solang and excellent view of three times valley And other activities like Paragliding, Zip lining,etc.in evening back to Manali , o/n stay and dinner in Manali hotel. After Breakfast move to Manikaran is 45 km. from Kullu. Manikaran lies in the Parvati valley of Kullu district. The spring is situated near the bank of Parbati River. These are confined to several groups of hot water springs emerging at various locations spreading up to a distance of about 1.3 kms along the river from the old bridge to Brahmaganga. The springs at Manikaran come out to surface with pressure and are very hot. There is no sulphur or iron mixed in the waters, but it is said to be radioactive. The water of these springs is so much hot that pulses (dal), rice, vegetables etc. can be boiled and cooked in it. In the evening move back to Manali. After breakfast drive to Dalhousie on the way Palmpur Tea garden,Baijnath Tample,Chamunda ji Temple in evening arrive Dharamshla o/n and dinner in Dharamshla hotel. After breakfast visit Dharamshala local like mclodeganj,dal lake,Bhagsu nag temple,cricket stadium, Kangra fort,Brijeshwary temple, afternoon drive to Dalhousie o/n and dinner in Dalhousie hotel. After breakfast drive to Khajjiar, Khajjiar known as Mini Switzerland, and sightseeing of places like Kalatop and dainkund etc. evening back to hotel, o/n and dinner in Dalhousie hotel. 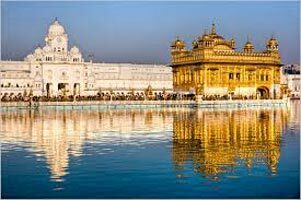 After breakfast check out from the hotel and move towards Amritsar, in evening visit Wagha Border, in the evening visit Golden Temple. o/n stay in Hotel Amritsar. 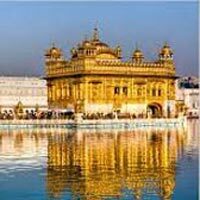 After breakfast check out from the hotel visit Jalianwala Bag, Durgiayna Temple, later of day drop at Airport for your onward journey.